JCCS is excited to announce the admission of 15 month old students to our already existing Early Learning Center. We are honored to announce that Mrs. Ali Curtis will be the Director of the JCCS Early Learning Center which comprises students from 15 months of age to Kindergarten. We are looking forward to the 2018 – 2019 as we build champions for life. Congratulations to all of our students who competed in the 65th annual State Science & Engineering Fair which was held at LSU March 18-19, 2019. Junior Division winners from JCCS include Michael Sam-Pang -3rd place in plant sciences and Ben Taravella -3rd place in Microbiology. Michael also won received Broadcom Masters award. Senior Divisions winners from JCCS included 1st place in Energy Physical, overall top project, ISEF trip to Phoenix & 5 special awards - Rachel Pizzolato; 2nd place in Embedded Systems - Preston Guedry; 3rd place in Engineering Mechanical - Grayson Barron; 4th place in Biomedical Engineering - Kylie Simon; 4th place in Mathematics - Collin Guggenheim; and Honorable Mention in Agriculture - Justin Unger & Colton Kendrick. Congratulations to Milaya Ruffin for making the LHSAA All-Academic Composite Team for Volleyball and Tennis. The All-Academic 4.00 Scholar Team is composed of senior student-athletes who attained the highest grade point average. She will be recognized and honored during the Volleyball and Tennis State Championship Games. Congratulations to Rachel Pizzolato (8th), for being chosen as one of the top 300 MASTERS in the 2017 Broadcom MASTERS®, a program of Society for Science & the Public. 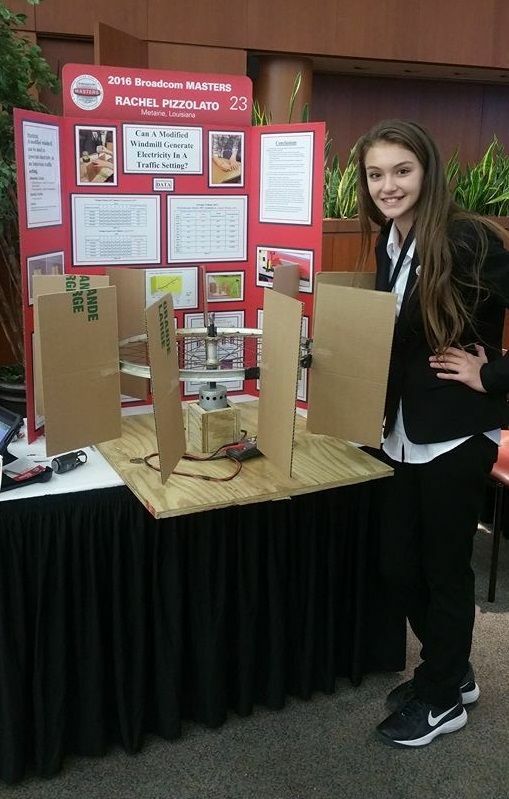 This honor places her among the top 300 middle school science and engineering science fair projects in the United States from over 6,000 nominees.